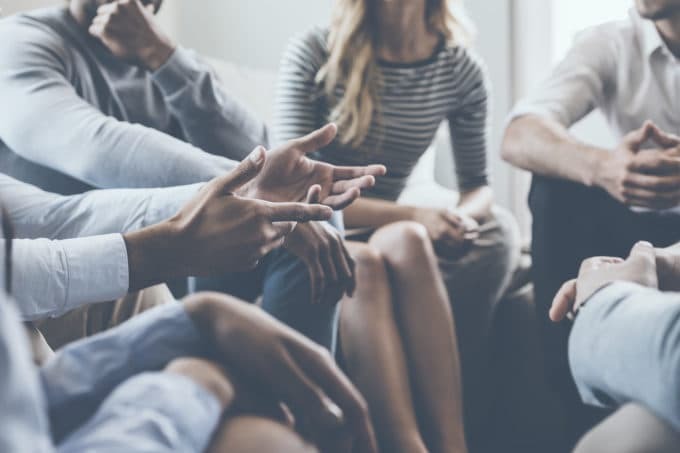 More and more, we’re seeing alternative methods of recovery pop up across the media landscape – ones that have nothing to do with the 81-year-old tradition of Alcoholics Anonymous. I think it’s important to keep that news coming, because options are great. First of all, back when it was just Bill W. and the crew in 1935, yes, the “God” in those steps had a capital G. But as time went on, plenty of atheists, agnostics, and Buddhists found ways of making that word work for them. “Faith” simply means that you’re willing to trust in something greater than yourself. It’s the willingness to think positively, to be able to take a deep breath and know that the world doesn’t revolve around you, nor is it out to get you. It is the belief that you will be okay. Granted, it’s easy and almost tempting to find fault with a group that is pretty much governed by whoever walks in off the streets and sits in the chairs. In fact, I almost got pushed out of the program several times in my first six months of sobriety because I took prescription medication, which people had opinions about – opinions that they should not have imposed on me during such a vulnerable time, and because it has nothing to do with the program, anyway. The reason I stuck around was because, even during those tough early days, I had already seen it start to “work.” I came in, to be sure, as someone who had lost her faith in humanity, in people, and in the world as a whole. Yet, once I started this program, I began to change, and the craving for alcohol and weed dissipated in a very real way. This is because the actual psychology behind the 12 steps is incredibly effective. These steps are like homework you do to grow and change, and the program offers a network of people who you can relate with. It works because, like Cognitive Behavioral Therapy, it involves an active effort to change problematic ways of thinking, perceiving, behaving, doing, saying, and so forth, that cause us to want to check out, rather than sit with our feelings. We find that there are better ways to self-soothe, and everyone in recovery needs some sort of social support. It was, and continues to be, invaluable for women like Carol from Massachusetts, who has been sober for 26 years, ever since her daughter was five years old. If it’s a case study you’re after, how about this one: AA started with two people in 1935. Today, there are over two million active members in 77 countries, and nearly 118,000 groups that meet regularly. There’s your proof of efficacy. Dennis Bates, CADC, LADC-I, Director of Clinical Detox Programs at Mountainside Treatment Center, finds that AA is still effective today because of its powerful core beliefs, none of which are religious. “There’s the belief that in helping someone else, you’re helping yourself, the use of group therapy, the idea of a ‘common issue with a common solution,’ recognizing that there is a power and purpose beyond yourself, moving away from the inherent self-centeredness that can occur with addiction. These concepts are still impactful today,” he said. Bates went on to say that, while certain elements of the AA model may feel a bit wonky – like terms in the Big Book that reference the more traditional gender roles women had in 1935 – the general guidelines, suggestions, and pathways to recovery are not. As for those people who come in and still “don’t get better,” that’s not the program’s fault. The program is not a person or a thing with agency. We’re all responsible for ourselves, and, chances are, we need more than “just” the program in our lives to really recover. We need to take care of ourselves in other ways, both medical and holistic. For my part, I do things a little differently than I did when I first came in five years ago. I go to fewer meetings. I lean less heavily on my sponsor. I don’t have sponsees. I don’t do “group activities” or go on retreats. I don’t have one meeting I go to every week. I’ve done enough stepwork to last me quite a while. This is the way that works for me right now, and I do it without feeling the need to reject any alternative methods that work better for my friends, peers, or colleagues, or justify it to some people within AA who work their program differently. We’re all “here” for common reasons: we can’t drink like normal people, we want to stop drinking, and we want to be free of all the crap we carried around with us. We also want to stop making our lives more difficult than they have to be and creating problems for other people, too. For what it’s worth, I also don’t think the great modern-day female writers of our time – women who found their solution in the program, like Mary Carr, Sarah Hepola, and the late Caroline Knapp – are or were “irrational” women. I do think that putting down other people’s beliefs in order to make your own argument feel more valid is just as bad as one religion attacking another. There’s enough room for all of us to choose a path to recovery that makes sense at any given time in our lives. Please, continue to let us know what else is out there, but don’t bash a program that has saved countless careers, families, and lives. It doesn’t sound like a very healthy attitude to me. In fact, it sounds kind of irrational.